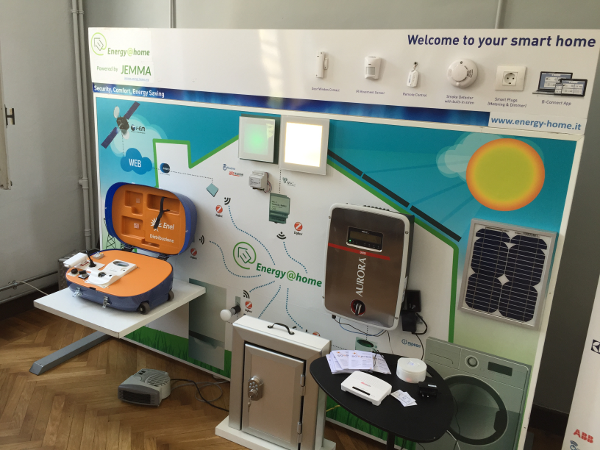 Casa Jasmina, the first connected home built totally open source, celebrated its grand opening in Turin, Italy, on Saturday. Smart homes -interconnected household appliances and domestic technology controlled by computer, connected cars -the automobile as cybernetic system, driving partly or even fully autonomous, wearable technology probes that we carry directly attached to our bodies, as smartwatches, wrist bands, or smart textiles, and finally smart cities, a pervasively networked communal administration – this is the IoT, the Internet of Things, which is about to enter our daily lives, and will maybe change it even more than the World Wide Web and the smartphone has done. What is it like to live with connected technology? More than two billion people already access the Internet via their smartphones. A smartphone is in fact a platform to support some twenty different probes, sensors that continuously track our movements, whereabouts, connectivity, and many other dimensions. However, this is not how people experience using their devices. Phones and tablets appear quite similar to books with just a bit more functionality. We use our mobiles as media, and we hardly ever see them as part of some Internet of Things, of course. Thus is it far from trivial to make a truly connected life visible. So this is one aspect of what Casa Jamina is about: It is a showcase for living with connected technology at home. Digital technology has changed almost everything in business as well as in our everyday lives. However, even if I recognized something would happen, I was never able to convince people of the consequences, that in my view had become unavoidable. Then change struck, and left its victims bleeding on the field, often enough lethally wounded. I love digital technology. I love social media, search engines, and wikis. But I moan about how easy we give away the public space, our people had been fighting hard to achieve. I moan loosing social and political control to economic reasoning. I don’t want to give away one other bit of what is left of our public goods. This is why we wrote the Slow Media Manifesto five years ago, this is why we argue to have Slow start-ups instead of more disruptive technologies. Demonstrating open alternative to proprietary platforms in the IoT is the second task, Casa Jasmina was conceived for. At Wired Nextfest 2013, I heard Bruce Sterling suggesting a possible strategy to counter the “Silicon Valley way” of doing technology, that with good cause is called “platform capitalism” by some: Bruce suggested Open source luxury. Instead of harvesting network effects, scalability, and winner-takes-it-all economics, he advocated for economic value, based on craft. Open source, he said, would be no contradiction to luxury, at all. It would rather foster craftsmanship as point of differentiation. Instead of forcing people into an operation system, to lock-in the users to subscription plans, open source luxury would offer convenience as well as freedom of choice. And from September 2014 on, Bruce announced how this idea would be rendered tangible: The Casa Jasmina. 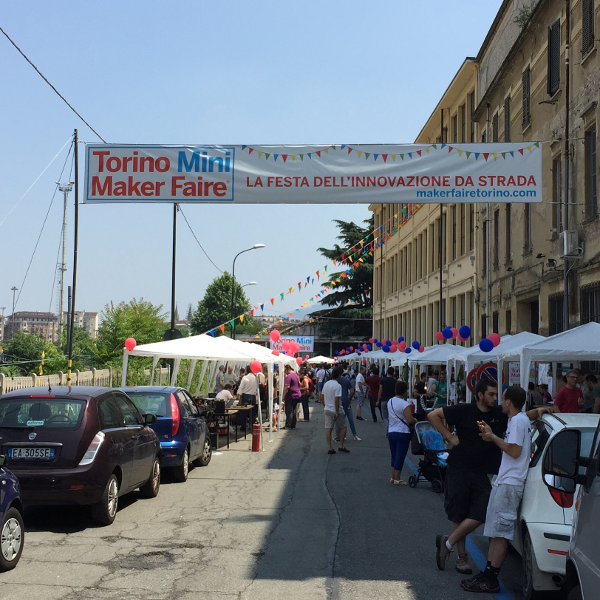 Named after Jasmina Tešanović who would originally came up with the idea, the first open source connected home would root into the Turin Fab Lab, and its Arduino ecosystem. It would be a field trial for technology which will pervade our homes one way or the other. Casa Jasmina will be a connected home with real people living in it. It will be not just another corporate showroom with fancy displays that nobody will ever really use. No jetpacks, no flying cars, no talking refrigerators enhanced with silly home entertainment displays nobody had asked for. Casa Jasmina is based on two foundations. First, the Arduino, open source hardware that has become the leading platform to control the IoT. The Arduino is a genuine Piemontese invention. 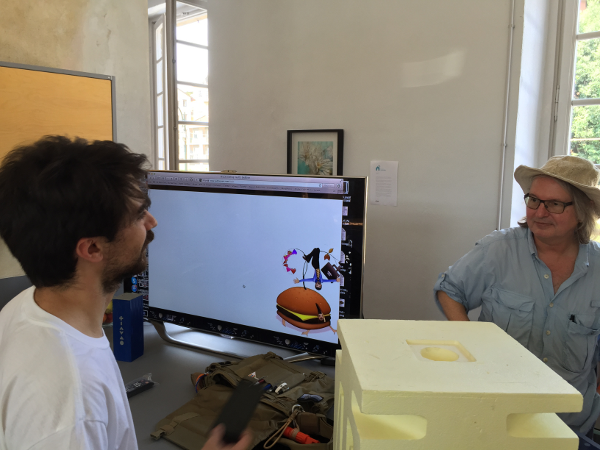 Started at the Interaction Design Institute in Ivrea, it is developed by a team around Massimo Banzi in a small office above the Fab Lab in Turin. While open source, the Arduino is partnering also with traditional consumer electronics suppliers like Intel or Samsung. A huge community of people commits to the development of Arduino based applications. Together with its English counterpart, the Raspberry Pi microcomputer, the Arduino now provides the strongest support for the Internet of Things. The second foundation is design. How things look, how things interact with us and with other things, what materials are used, and what story they tell, this is as important to what things are, as is their technical functionality. Casa Jasmina is somehow design fiction, design that shows, what would be possible, to let us experience, how that feels. But other than the regular design fiction, Casa Jasmina will have objects that really work, that can be used, or if not, to be replaced by other things that would do the job. Designing things that really work is different from doing a display to just show off. Thus the things to see at Casa Jasmina might be edgy, but they will have to work with the inhabitants, and not just preveil until some trade fair’s doors close. The buildings at Via Egeo that house the Fab Lab and Casa Jasmina are the remains of Turins famous industrial past as Italy’s center of metall processing industry. And now it is there, at Via Egeo No. 16. The architecture of Casa Jasmina is genuine Futurismo Italiano: Built in the 1920s, the floor of the Casa used to be the apartment for some managing ranks of FIAT, sitting right on top of a steel foundry, meant to tear down the walls between private live and industry; what better metaphor could there be for what we have today! Like the futurists demanded but had never fully realized, the Internet of Things will diminish our privacy, the bourgeois concept of private home. But instead of letting this lead right into fascism, as we had seen futurism end in 1930s, we have the chance to nudge the contemporary futurism onto a benign, democratic trail. “We must put human values into things”, as Bruce Sterling put it. Bruce Sterling and Lorenzo Romagnioli in Casa Jasmina’s kitchen. The exterior of Casa Jasmina still looks a bit run-down for Turin standards, but it would very well pass for an average apartment building in say Naples. The staircase leading to the building’s Piano Nobile is rather narrow and I suppose it was originally ment for servants and deliveries. 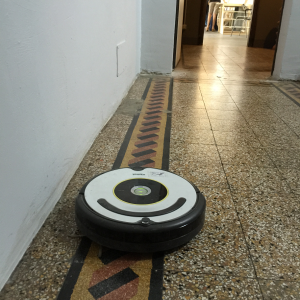 We enter the flat through a small hallway, painted in dark grey, with a programmatic text of Bruce Sterling to introduce the visitor to the project -like you would expect an arrangement at some museum’s exhibition. Opposite of this wall lies a very basic bathroom. Straight on, a spacious corridor opens, painted all white leading along huge windows on the right giving view to a roof garden. Left is a small living room, not seperated from the corridor by a door or threshold, but by a bookcase, a design study by Caterina Tiazzoldi. A spacious kitchen, also open to the corridor, lies separated by a wall next to the living room. Behind that follow to more rooms with doors, to be used as bedrooms when Casa Jasmina finally will house its inhabitants. 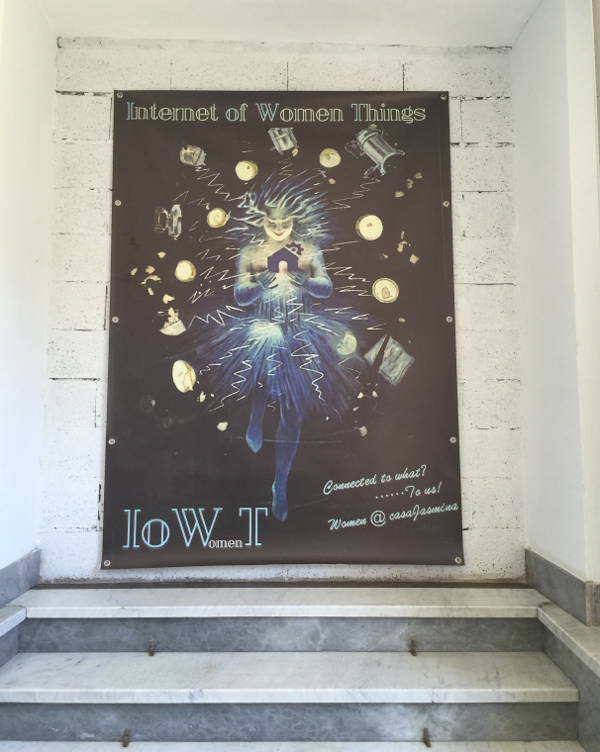 At the end of the corridor, a few stairs lead to a wall with an A0 sized poster displaying an allegory of “The Internet of Women Things”. Behind that might have been a double winged door that was probably the original main entrance. The floor in the bedrooms, the kitchen and living room is covered by an expensive, arfully made oak parquet that somehow survived the long decades during which the building had been abandoned and degrading. 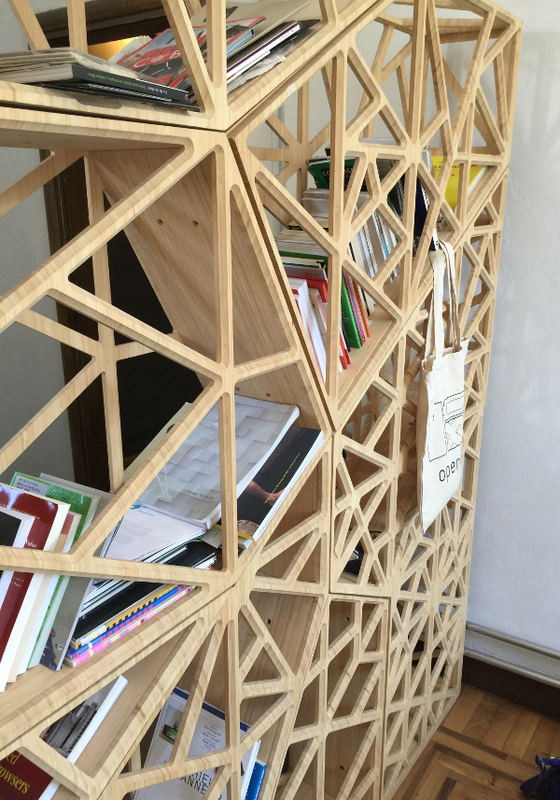 Most of the furniture is designed by Open Desk, a London based design shop that publishes patterns for furniture, easy to be cut out from plywood. 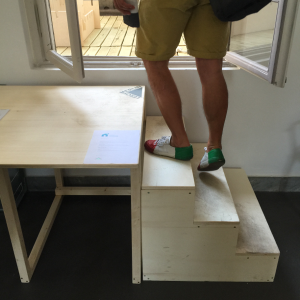 Open Desk’s way of distributing their designs for free is far less uncommon than we might naively think. It is rather something we used to have until very recently. If we would go to a carpenter, the artisan would show us different design examples from pattern books or catalogues. We would then commission the work based on a pattern, and the furniture would get made. So good quality in furniture is by no means connected to securing intellectual property. Rather the opposite: Only mass produced goods need protection because they can never meet artisan standards. Marco Biranza’s ‘9 Random Spots’ is nice piece of calm technology. The color pattern changes, whenever the connected Geiger counter registers an accidental decay. 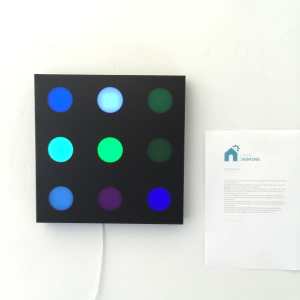 Smart things in the Casa Jasmina so far consist mostly of works of art, playing with concepts of Calm Technology. Some off-the-shelf smart tech has also found its way into the house. A Roomba, not connected at all, however in a way autonomous, and a Samsung Smart TV set. Right on the evening of the Casa’s grand opening, Juventus Turin faced FC Barcelona in the Champions League’s final, a game not to be missed by anybody in Turin, of course. But despite all the nerdy and geeky people around, we weren’t able to get this Smart TV set . 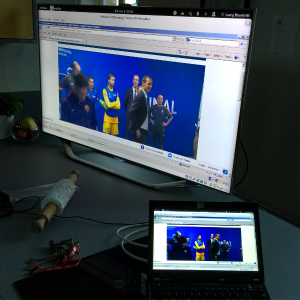 In the end, I plugged my Laptop into the Samsung set, degrading it into a totally dumb screen for the really smart and connected however totally 20th century device that my PC is. Trouble went on after that was done, and realized, that Mediaset, Italy’s dreadful broadcast trust, would only stream their content via Silverlight – a video technology so outdated, that even its inventor Microsoft had long ago stopped supporting. So I had to start a virtual machine with Windows on my computer, and run an ancient version of Microsoft’s Internet Explorer in that. This funny anecdote illustrates, what’s wrong with how the smart home business is implemented by the traditional consumer electronics companies. The design of the TV set is still the same as when there were just a couple of stations to switch between and no need for a keyboard to type in complex commands. Even worse is Mediaset’s online video service. Driven by the station’s wish to maintain control over the “digital rights management”, they built their proprietary system of content distribution with tools crippled for the very same reason. If such outdated software would run critical infrastructure, it would easily become a security risk. You wouldn’t even want to run your laundry with that. Consumer electronics has the reputation to be an industry with the worst user interfaces and the lowest understanding of people’s behavior. If you have ever tried to program the clock of your stove, you know that CE engineers must be living just at the opposite site of the universe than their customers. Household technology was always outdated, obsolete electronics refurbished to once more generate some money. This is really not the industry you would want to resign your private data to. Neither are utility companies, which are among the main drivers of Smart Home, famous for their customer care. On the other hand, we are becoming more and more used to doing things mobile. Services that are not accessible via app feel outdated and inefficient. People once having experienced the mobile convenience, will benchmark all electronic things accordingly. And why not? Just because the legacy providers of our services and products are not delivering according to our demand, should we take abstention? Should we give in, and keep to outdated, inefficient products that waste our time, energy and other resources? Will my home be run by Google Nest or by Apple Home? Imagine the ridiculous situation, when you decided to buy some smart device from one provider, and that would require all your other stuff to run the same proprietary operation system. You’d have to either give up your smart home functionality or to restock everything with the matching system. There might be some brand purists that want to mindlessly live in a monoculture. For most people, this seams not really practical. To become successful, smart appliances will have to be seamlessly interoperable with each other, too, no matter who manufactured them. This is not the business model of companies like Google or Apple. Open standards for interoperability is what open source stands for. The Arduino is the most advanced and most stable IoT technology anyway. But open source technology is not only better in making things work together. Open source means, that people can hack it, dismantle it, understand, how the thing and more important, its software really works. This is the only way I now that helps to make things secure. Only what can be hacked gets thoroughly tested. Only when there is a vivid discussion going on potential security flaws and how to patch these, we will get safe technology. This has been lessen we should have learned by now. Privacy, informational self-determination, and algorithm ethics become even more important with the IoT, “the Internet of Things and Humans” as Tim O’Reilly calls it, or what might be even clearer, the “Internet of Everything”. Concepts like Big Data or the IoT bear the danger to get killed by overexposure and buzzwordization. The marketing and tech babble disguises, how pervasive the influence of digital tech on our lives already is. A human-scaled model of the smart home will help to make that visible. We will be able to explore how to get the best from the truly remarkable development, that could realy help us, not only to make our daily lives more convenient, but even more meaningful, more social, and more sustainable. And this is why I belief Casa Jasmina is a very important project.